story by Marisa McClellanOnce the growing season in the Philadelphia area kicks in, we get six to eight good weeks before the weather is too hot for delicate lettuces. While they do return in the fall once the heat lessens, I take that initial and finite season as a challenge to eat as many local green salads as I can. I eat salads for breakfast with a sliced hard boiled egg and a bit of toast. At lunchtime, I heap whatever leftovers I can find on my dish of arugula, spinach and butter lettuce. And for dinner, I set up a mini salad bar on the kitchen counter so my husband and I can each build the salad we crave. In addition to chopped vegetables, grated cheese, grilled chicken and dried fruit, I like to prepare a couple of toppings to make our salads special. Savory granola adds crunch and flavor to your salad (it also goes quite well on smooth soups). Homemade dressings like roasted tomato vinaigrette or Greek yogurt dressing with herbs are a nice step up from the bottled stuff. 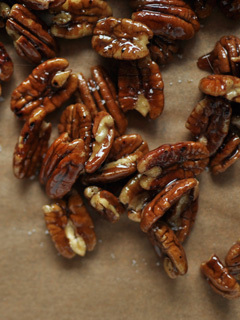 And for a hit of sweet and salty, a few of these maple-glazed pecans are just the thing (they’re also delightful on a cheese plate). In a small bowl, whisk together yogurt, buttermilk and red wine vinegar until smooth. Add garlic, chives, dill, salt, pepper and onion powder. Stir to combine. Taste and adjust salt and pepper amounts, if necessary. Place a large skillet over medium heat. Add pecans and dry toast until fragrant, shaking pan frequently to prevent burning. Add maple syrup to pan and stir rapidly as the syrup bubbles. When syrup is reduced, scrape nuts onto a sheet of parchment paper and sprinkle with salt. Let nuts cool completely, and then store in an airtight container. Wash tomatoes and spread on a small, rimmed cookie sheet. 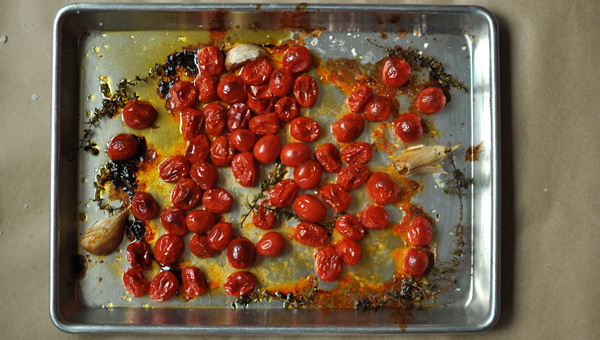 Scatter unpeeled garlic cloves and thyme sprigs around tomatoes. Drizzle with olive oil, and sprinkle with salt and pepper. Roast for 20 to 25 minutes, until tomatoes are tender and shriveled. When tomatoes are cool, combine them in a blender pitcher with red wine vinegar. With the blender on low, stream olive oil into dressing until fully emulsified. Add salt and pepper to taste. Combine oats, pepitas, sunflower seeds, sesame seeds, cheese, rosemary, sea salt and pepper in a large bowl. Toss to combine. In a smaller bowl, whisk the egg white, olive oil and Sriracha until thick and frothy. Pour the egg white mixture over the oats and seeds. Stir until well mixed. Spread granola mix on a rimmed cookie sheet and bake for 25 to 30 minutes, stirring several times during baking. Granola is done when fragrant and golden brown. Let the granola cool fully, and then store in airtight container. Well-sealed, the granola will keep 10 to 14 days at room temperature. For longer storage, put in a zip-top bag and keep in the freezer.